Families arrive at East Hamilton Middle High School for a community meeting unveiling of plans for the new East Hamilton Middle School on Tuesday, July 10, 2018, in Chattanooga, Tenn. The new $36 million middle school will be built near Apison Elementary. This story was updated Feb. 6, 2019, at 4:27 p.m. with more information. The Hamilton County Commission approved a new school — but not a new press box — Wednesday morning. 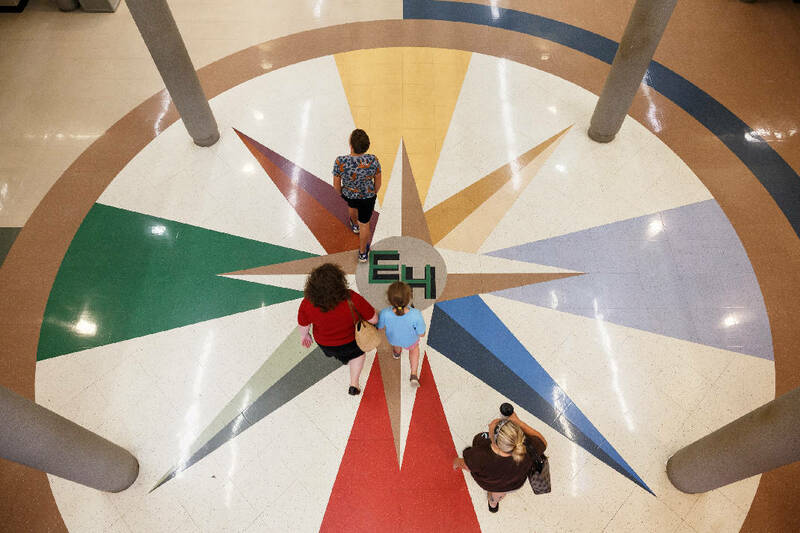 With few comments, the commission approved more than $42 million for the new East Hamilton Middle School, one of several projects laid out in the school district's 2017 plan for $110 million in bond funds allocated by the commission for capital projects. 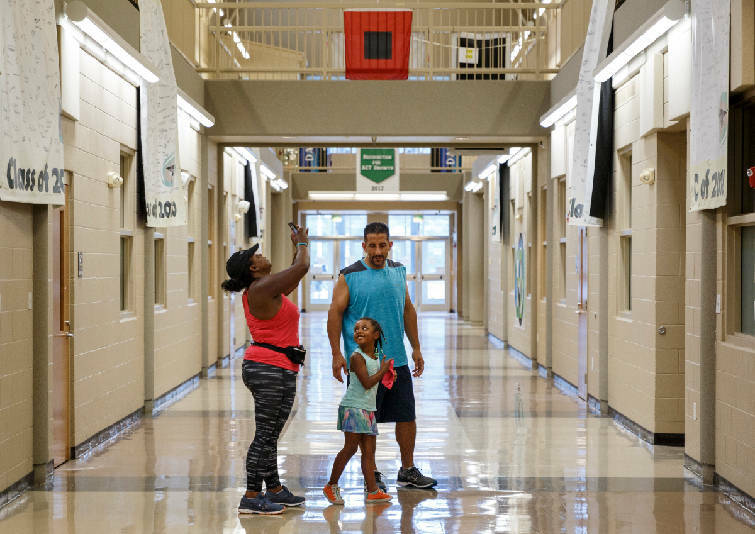 Tahnika Rodriguez, left, Armando Rodriguez, center, and their daughter Chloe arrive at East Hamilton Middle High School for a community meeting unveiling of plans for the new East Hamilton Middle School on Tuesday, July 10, 2018, in Chattanooga, Tenn. The new $36 million middle school will be built near Apison Elementary. The project, District 4 Commissioner Warren Mackey pointed out, was a little pricier than East Hamilton Middle/High School or Signal Mountain Middle/High School have been in recent years, but District 8 Commissioner Tim Boyd said it was coming in under the predicted $45 million budget for the project. "Forty-two million with athletic fields seems like a very fair price considering that raw materials and supplies have gone up," Boyd said. "I think Hamilton County is getting a pretty good deal. I'm happy to see this under budget." The new school will relieve overcrowding at the current joint middle and high school with a capacity of about 1,200 students. It is slated to open in time for the 2020-2021 school year. The county and school board presented design plans for the 165,000-square-foot building and talked schematics with students and families at community meetings last summer. Also during the meeting, a controversial resolution proposed at last week's agenda session by District 9 Commissioner Chester Bankston to appropriate $182,598 for a new press box for Ooltewah High School's football stadium died without a second motion or support from other commissioners. School board members sounded off earlier this week about the proposal, with many of them claiming they hadn't heard anything about the project before. School board members Joe Smith, of District 3; Rhonda Thurman, of District 1; and Tucker McClendon, of District 8, all said they were disappointed in the commission's push to approve a project that hadn't come through the school board. During Wednesday's commission meeting, Bankston commented on his failed proposal. "Justin Witt [the school district's director of facilities] told us [the existing press box] was unsafe. I know it's unsafe, I've been in construction for 40 years," Bankston said. "If God forbid someone gets hurt up there, someone gets killed, I hope y'all can live with that." Asked for further comment after the meeting, Bankston would add only that school board members had called most of the commissioners to ask them not to vote to approve the press box. McClendon said he had called several commissioners to discuss the matter and was happy with Wednesday's outcome. "I think that it speaks volumes that it didn't even get a second," he said. "I applaud those commissioners who thought the process taken to get the press box was wrong and not the way that business has been done in the past. I think going into the budget season it can be done the right way." Bankston's proposal at last week's agenda session helped reignite the debate of how commissioners are to request funding for projects outside of the budget cycle without discretionary funds. District 7 Commissioner and chairwoman Sabrena Smedley declined to pass judgment on how Bankston introduced the resolution, but did ask Mayor Jim Coppinger to clarify that process. "I would suggest that any request that any commissioner may have should come through you," Coppinger told Smedley. The commission also approved the school district's proposal to use SunTrust Bank to provide its new procurement card services as well as the mid-year budget adjustments for the district.